DON'T DROP YOUR FIRESCOUT IN A DAM! In September this year, Australian manufacturer Rapid Spray are launching the SprayScout and its variants, the FireScout and the PressureScout. Rapid Spray have developed some really innovative equipment over the past few years, and it’s obvious the FireScout is a product of many years of listening to customer needs for more compact fire equipment. 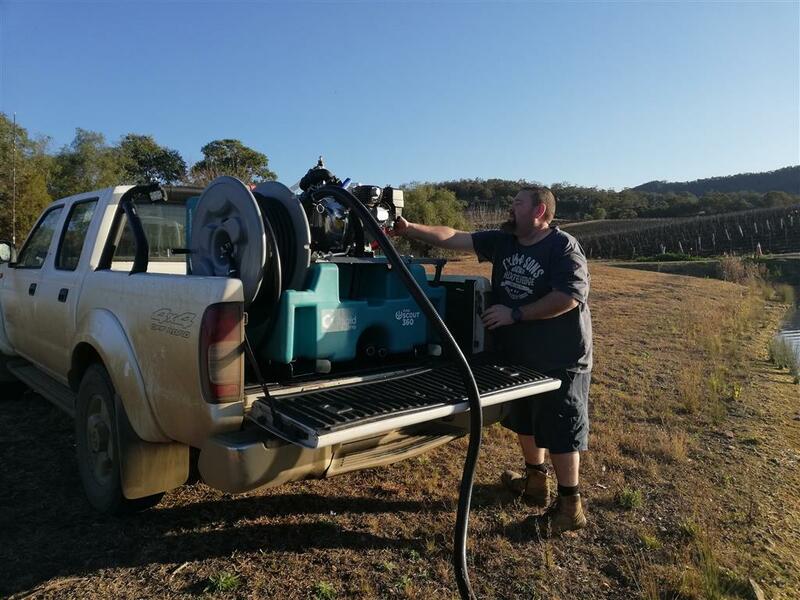 Earlier this month we were asked by Rapid Spray to take the first manufactured FireScout 360L out for a test run and let them know what we thought. Keen to try the new unit out, Kinsley and l took the FireScout out early in August and immediately ran into a few issues! The FireScout features handy tie-down points on all four corners of the tank, but being excited to get started, we unstrapped the unit and pulled it towards the tailgate of the ute for a closer look. 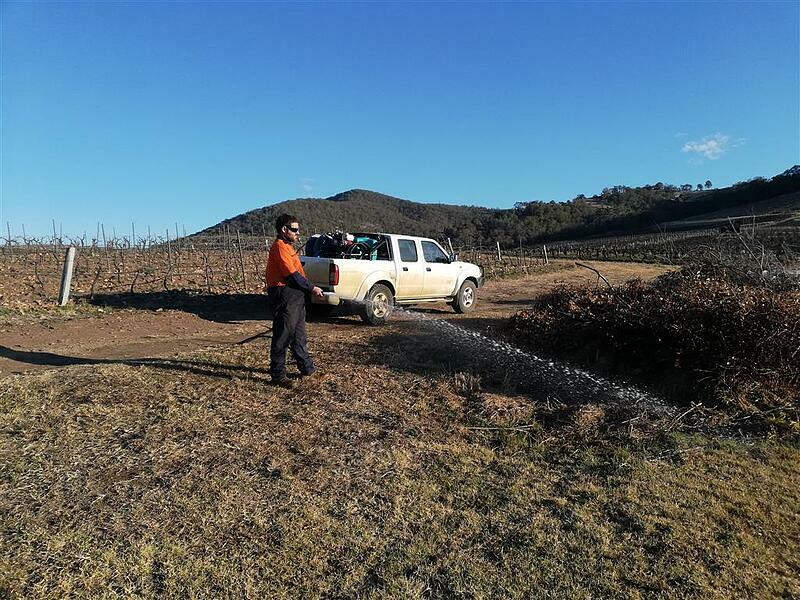 Backing up to a dam, we started filling up the tank, but as we were on a slope and the FireScout got heavier, without us noticing it started to slide down the back of the Ute. By the time Kinsley and l had noticed, the tank flipped off the back of the Ute and straight into the dam! Quickly, we pulled the tank out of the dam it, but it still came out completely covered in mud and we thought that we had ruined the unit! 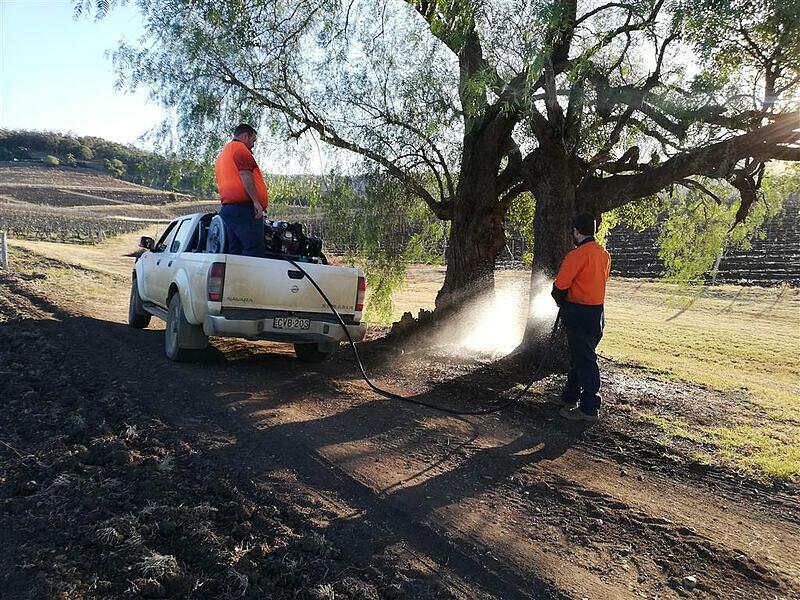 Washing all the mud off the unit, we were happy to note that the FireScout hadn’t suffered any damage and was able to be re-started with minimal hassle. In saying that, we are not advising to drop the FireScout into a dam next time you are filling the unit up! Making sure the unit was now secured to our Ute, we finished filling the tank, and headed out to test the FireScout’s capabilities. Refilling the unit was easy with the supplied 38mm hose for sucking water out of the dam which took no time at all, however we did think the hose could be longer for dams that are harder to reach. The versatility of this unit was very surprising. Not only would it fit into the back of a UTV tray, but it also fit neatly into my dual cab Navara between the wheel arches perfectly. With the easy tie down points which also double as handles, and the forklift points built it, it would be a breeze to swap the unit between your different vehicles including tub back utes. 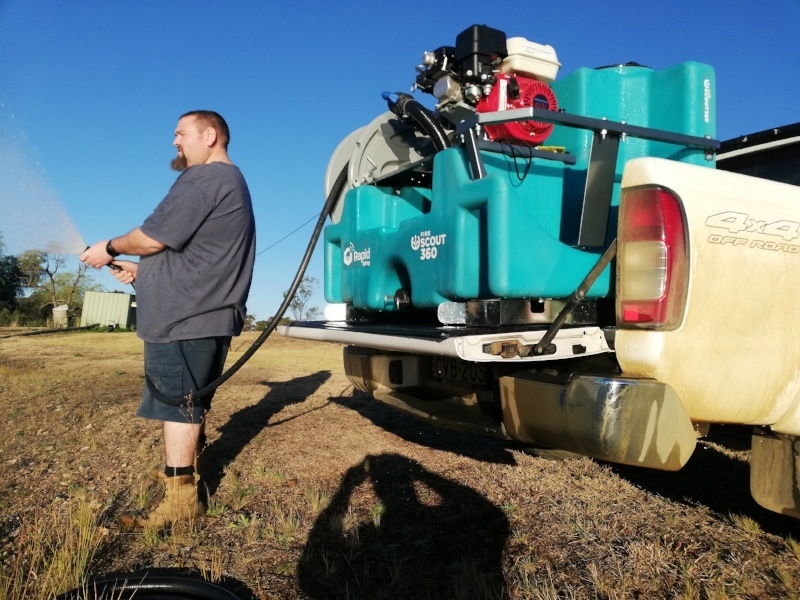 As we drove around our property we noticed the FireScout didn’t move around due to the built-in baffles inside the tank, keeping the FireScout steady the whole trip meaning there was little to no loss of water, and the Ute wasn’t swaying with the slosh of the water. With the combination of a poly hose reel with 36m of fire spec hose and adjustable nozzle, the very powerful Honda motor (which still worked perfectly with just a quick wash down and check even after being fully submerged in dam water!) and Aussie FireChief pump, the FireScout was very capable in reaching everything we required it to and more. We did feel the hose clamp which secures the suction line could have been positioned differently for better movement of the supply hose, and a net system on the left where the suction hose is kept would be an improvement on the current metal framework. The overall look of the FireScout is great with its streamlined look, and built in spot for the hose reel, pump and motor which are all easily accessed. 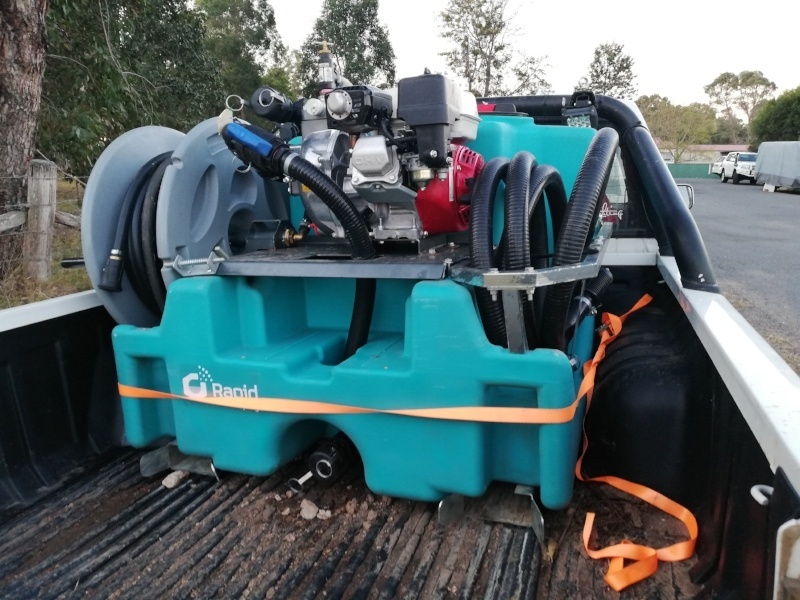 There is also an integrated additional 70L tank which Rapid Spray informed us can be used for foam concentrate when the optional foam system is fitted. Though small in stature, the FireScout does not sacrifice on performance. We would highly recommend this unit to anyone whether it be industrial, commercial, emergency services or for home protection. The FireScout will be available for purchase from October on-wards, or pre-order today! Want to know more? Learn more about the FireScout and SprayScout here.